John Baldessari, Emma and Freud, 1984. GRAZ, AUSTRIA.- Kunsthaus Graz at Landesmuseum Joanneum presents John Baldessari - Life's Balance, Works84-04, through May 16, 2005. Why is something art, and why is something else not art? This is how John Baldessari (born in 1931), one of the most important contemporary American artists, has described his concept. His oeuvre, which combines photography with painting and art-historical reference with everyday life, is a study of the impossibility of grasping total truth or obtaining complete knowledge. 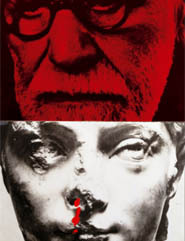 In his early video works and collages John Baldessari, as many conceptual artists in the mid-1960ies, focused on deconstructing the modernist notion of autonomous art, quickly developing his own unique stylistics characterized by the use of overlapping layers of texts and photographic images reproduced on plain white canvases. One of the missions set up behind the early works was to strengthen the mediums independent and emancipatory aspects. This very soon evolved into an attempt to confront and jam the media world with, what the artist calls, the real world. In the mid-1970ies he began to apply such techniques as cropping and montage to juxtapose appropriated press photographs and movie stills from nostalgic Hollywood B-movies of the 1940ies and 50ies in order to analyse an inherent ambiguity of meaning as well as to discover memories of the soul. His entire oeuvre seems to be marked by a continuous attempt to map a territory of the in-between: on the formal level it is a hybrid of photography and painting, on the narrative one, it is a sophisticated and humorous investigation into an almost baroque edifice of art-historical reference linked with the conventions of everyday life and found footage from all available sources of the collective consciousness. The body of impressively complex singular works from the period between 1984 and 1996 shows the apogee of a narrative tendency; the manipulation of images causes a visual vertigo. Works that belong to various series developed in the years 1996 to 2003 sum up the most recognizable aspects of Baldessaris style, such as overlapping layers of photographic material and painterly surface as well as compositional experiments with framing and the recurring usage of language confronted with pictorial narratives. In the very recent photo-based compositions from 2004, as the stylistically balanced Orange series, the focus on colour becomes very evident. The exhibition also includes a video installation, Five 68 Films (2002), which further develops the artists preoccupation with a specific act of surgery done on the surface of a cinematic image, and a special edition of The Life and Opinions of Tristam Shandy by Laurence Sterne with illustrations by John Baldessari, including 39 photo collages (1998).